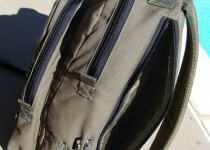 Tactical Tailor is a company that truly knows what “tough” is. 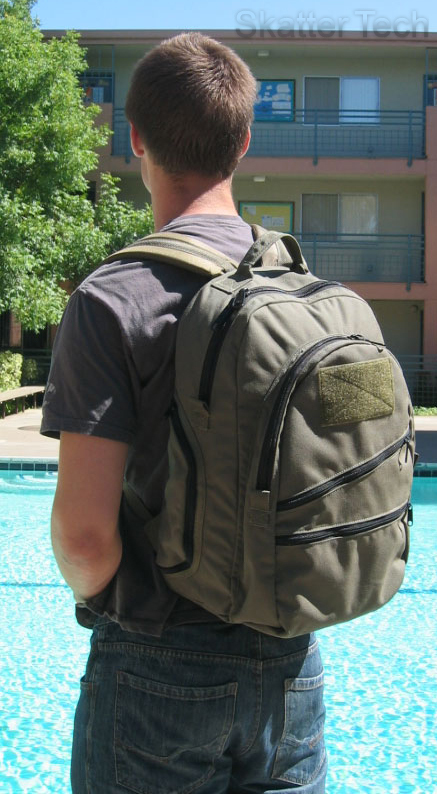 Founded by a US Army scout sniper, Tactical Tailor has the expertese and experience in what a tough pack requires. Tactical Tailor’s Enhanced Day Pack exhibits this knowledge throughout from the materials used for construction, a “KISS” attitude, and the inclusion of almost everything you need, without everything you don’t. 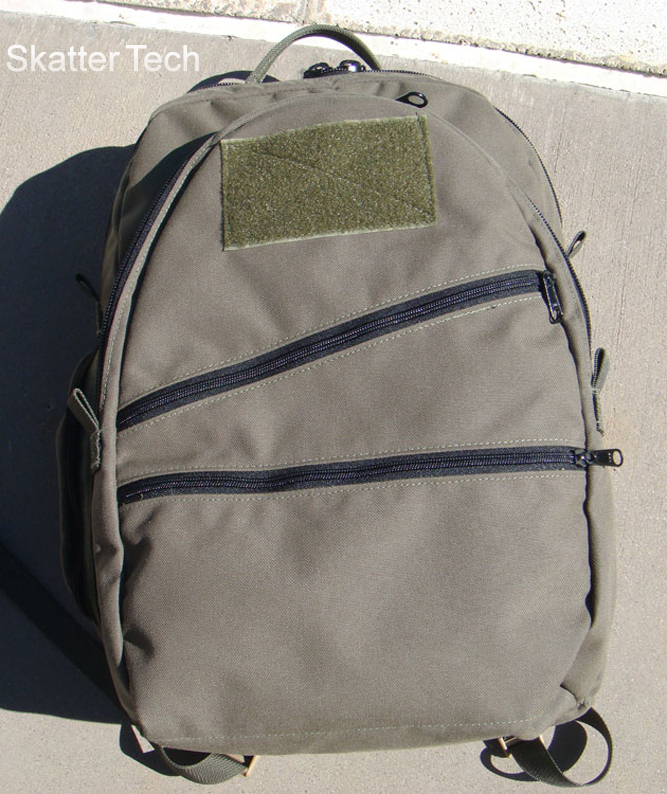 Constructed of mil-spec 1000D Cordura no other pack in our lineup contained such a rugged material. Cordura is a type of nylon developed by the DuPont company. The Cordura brand is now owned by Invista. Cordura is 3x more durable than normal polyester and 2x as durable as normal nylon. Both inside and out the Enhanced Day Pack is made of this almost bomb proof material. 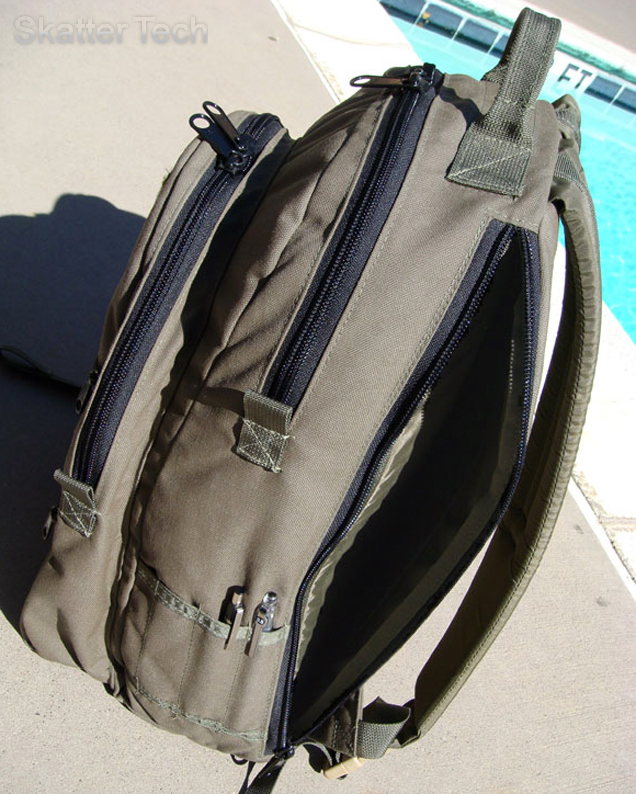 All zippers on the Tactical Tailor Enhanced Day Pack are genuine YKK and pull smoothly. There aren’t any flanges near the zippers to get caught making it very hassle-free. On the shoulder straps a nice amount of 1/2″ thick foam is spread throughout. Along your back is 3/8″ thickness foam in a 1000D Cordura enclosure. This pack doesn’t have a true internal frame-sheet per say, but the sturdy foam in the backing keeps the pack’s shape nicely and is a suitable substitute. At first glance the Tactical Tailor Enhanced Day Pack really doesn’t look very intuitive. It appears rather simple, bland, and boring. Using the pack however you’ll discover that this pack was designed by pure geniuses whose apparent goal was to make a very functional pack while keeping it simple. Located closest to the wearer on the side of the pack is a long zipper. Unzipping this reveals a side opening laptop compartment. While not very conventional, this design turns out to be a most splendid idea. The ease of removing or storing your laptop is increased as well as the speed. If you travel by air a lot, this side opening option is a godsend making taking out your laptop for screening much quicker and easier. As grand as this laptop compartment is, it does have a downfall. Users with 17″ notebooks have been sadly left out. The max this pocket will hold is a 15″. The next pocket down is the main compartment. This pocket is generous in size and will easily accommodate your textbooks and binders. No surprises there. The next pocket down is the organizational pocket. The size of this pocket is very roomy as well. You shouldn’t have any problem stashing another notebook or binder in there either. 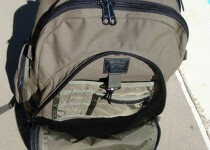 Located inside is a very sturdy key clip as well as a functional organizer. Past this pocket are two more standard pockets. One’s fairly tall should you have a smaller sized notebook and the farthest one acts a quick accessory pocket. 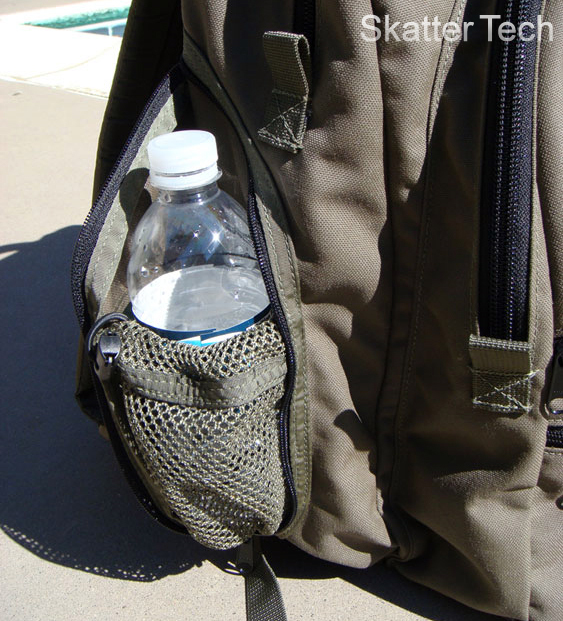 On the sides of this pack is a water bottle pocket and an external organizer. While some may prefer an extra pocket to the external organizer, I’ve found the external organizer to be one of the finest features on this pack. Should you need a pen or pencil it’s very easily accessible. Initially you won’t think this feature as very grand, but soon you’ll begin to wonder why all of your packs don’t have an external organizer. The opposite side water bottle compartment folds out to reveal a mesh with shock cord retention. This will expand to fit large nalgene bottles. You can also choose to store small camera in this pocket and zip it back up. The carry handle on this pack is very beefy and is reinforced on the inside. A welcome addition to this pack is the inclusion of double stitching. This significantly reinforces the pack and adds to the peace of mind. Out of this tank of a pack, the only complaint I had were the zipper pulls. When I first received the box this backpack was in I heard a good amount of metal clanking. At first I thought, “Oooh, Tactical Tailor must’ve sent me some extra goodies!” That turned out to be sadly untrue, and it was the large metal zipper pulls clanking against the zippers. While this is an annoyance, it’s nothing a little wrapping of 100mph/duct tape can’t fix. On the front exterior of the pack is a large hook and loop panel for fun patches or ID. However simple and plain looking the Tactical Tailor Enhanced Day Pack may seem, it definitely doesn’t sacrifice comfort. While there aren’t any specially engineered, space-age, rocket-science ergonomic designs built into the back, the Enhanced Day Pack was a leader for men and women in this lineup for comfort. 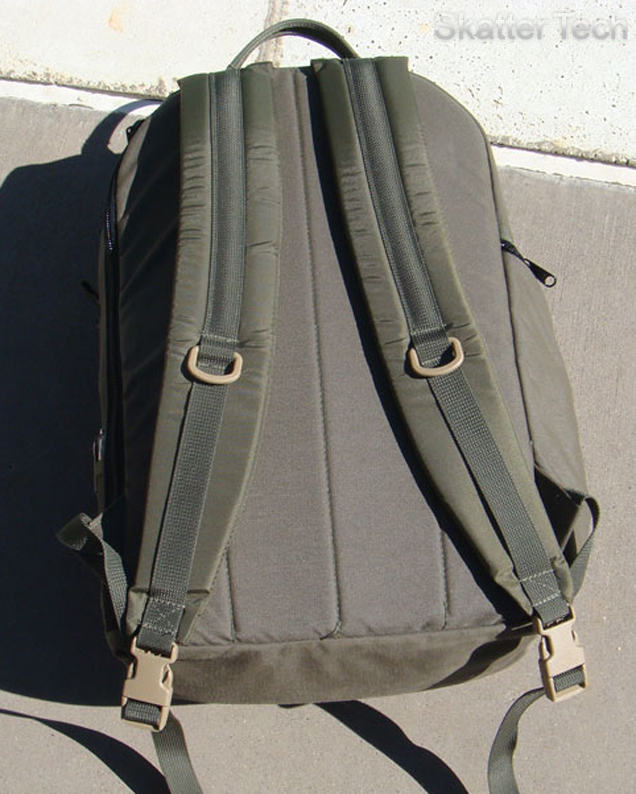 The nice wide shoulder straps distributed the weight well in conjunction with the padded back. There is hardly any ventilation for your back, leading to some sweaty moments, but the comfort is supreme. I would rate the Enhanced Day Pack a hair short of first place for light loads comfort, but with a strong lead in first with heavy loads. I recently purchased one of these packs and noticed, as did the reviewer, the noise of the zipper pulls. A few minutes with some diagonal cutters and about 5 feet of black paracord fixed the problem nicely, as I replaced all of the zipper pulls with cord, a much more attractive and permanent fix than a duct tape wrap. The noise of the zipper pulls does not bother me. I did not like the straps it came so I called them and for some extra cash they put their “Super Straps” which have thicker padding, more adjustments and a sternum strap. A great company and an even better pack. I got it the ACU pattern and no one else has one even close to it. Excellent review, encouraged me to go buy the pack from a local retailer. I’ve used it for a while now and fully agree with the praise on the review. At first I was quite sceptical of the very simple design, but in daily use it’s much more functional than the more complex designs. I’ve had some Samsonite, Jansport etc. packs with lots and lots of small pouches and places to hide stuff and often ended up having to go through them all to find something. Plus the small containers weren’t that well made, so they eventually ripped. There is one downside, however – the lack of compression straps around the pack. 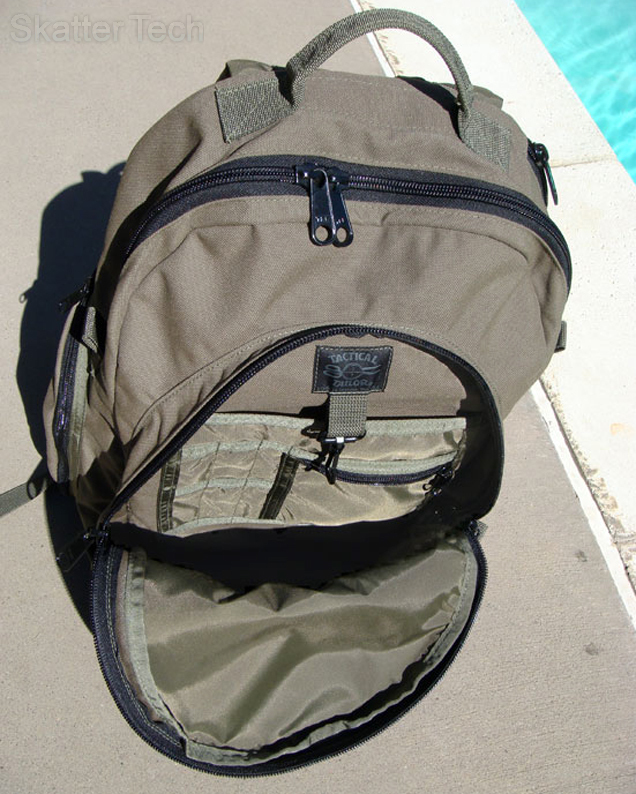 As the main compartment is fairly large, it ends up being a bit baggy on the days I don’t carry anything in it. It would also help preventing stuff from piling on the bottom of the main container, as I could strap the pack tight. This is a minor issue but worth mentioning, as it might be an issue for some people. The zipper pulls annoyed me too, so I put some cord on them (not cutting them off like Greg W). All in all, I fully recommend the pack.